If you’re an independent software vendor (ISV) who sells payment applications to retailers, what does it mean when your payment application meets PCI standards, but doesn’t actually protect your customers? A lot of people out there, especially consumers, wouldn’t even think the security of the software that handles their credit card data is an issue. Many people don’t realize that there’s a huge problem with data security in point-of-sale (POS) and retail software applications. However, time and time again we see major data breaches occurring through cash register systems that process credit card data, which invariably means that those systems aren’t adequately protecting consumer data. The problem with data security in payment applications arises when retail ISVs and POS vendors certify their payment applications with the Payment Card Industry Security Standards Council (PCI-SSC). The PCI-SSC requires that these businesses use strong encryption and encryption key management in their payment applications. Although most payment application vendors incorporate encryption and encryption key management into their solutions, many of them do it poorly, skating by with the minimum requirements. In the end, their applications pass certifications but would not protect their customers--or themselves--in the event of a data breach. And data breaches are happening every day! Today data breaches are considered a matter of “when,” not “if.” It is almost a certainty that it is only a matter of time before a data breach affects one of your customers. Unfortunately, encryption and encryption key management are complicated tools for ISVs to build on their own--in fact, doing a “home grown” encryption project is almost never recommended by encryption experts. Because many ISVs don’t have the resources to create their own encryption and encryption key management, Townsend Security offers an encryption key management solution that retail ISVs and POS vendors can integrate into their applications to provide their customers with industry standard, certified data security solutions. To read more, download the eBook now. The Right Data Security Partner Can Make a Difference! Your company competes against many other ISVs selling niche retail management software and payment applications. You need a strong partner to guarantee you are providing the best encryption and key management to your customers. Because when payment applications don’t adequately protect encryption keys or use encryption key management best practices to secure cardholder data, they leave your customers extremely vulnerable to data breaches. I know... you are thinking “Key management is both costly and difficult” - while that reputation was accurate ten years ago, today certified encryption key management using best practices can be achieved quickly, easily, and at an affordable price. We help you by offering encryption key management that is quick and easy to deploy, has a cost effective licensing model, and we will even OEM or “white label” for you because we don’t believe issues around branding should get in the way of good data security. We believe that data security should be constantly evolving to meet the challenges of new security threats. Retail ISVs and payment application software companies need to know that although their solution may have earned a PA-DSS certification, these standards, like all PCI standards, are not set in stone. Just because a solution has been certified once, outdated encryption and key management practices might not suffice during the next certification process. Since encryption and key management are necessary components of payment application systems, providing customers with third party OEM NIST-certified AES encryption and FIPS 140-2 compliant key management would give an ISV some critical advantages. Townsend Security not only supplies NIST and FIPS 140-2 certified encryption and key management, we'll help you achieve your own FIPS certification under our OEM program. In order to confidently protect your customers, NIST and FIPS certifications ensure that encryption key management has been tested against government standards and will protect compromised data in the event of a breach. While many payment applications have a PA-DSS certification, in order to protect your customers from a data breach, you must not only meet these certifications, but also build a security solution that will truly protect data at rest and data in transit using industry best practices. Data security must be a critical element in your risk management plan and conveyed well to your customers. With our NIST and FIPS certified encryption and key management solutions, retail ISVs can offer easy and affordable industry standard data security. Townsend security has redefined what it means to partner with a security company. Our dedicated team provides our partners with extensive training, back end support, marketing materials, and a cost effective licensing model. So when (not if) your customer experiences a data breach, and you have implemented adequate security that renders the compromised data unreadable, you will not only be your customer’s hero, but your own company’s hero as well. 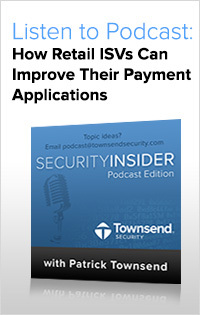 In this complimentary podcast, security expert Patrick Townsend discusses “How Retail ISVs Can Improve Their Payment Applications” with Paul Taylor from Security Insider. When it comes to encrypting credit card numbers to meet PCI security regulations and prevent data breaches, point of sale (POS) vendors selling payment application software often implement encryption key management that is cobbled together and doesn’t meet best practices. For POS vendors who supply retail businesses with complete cash register systems, including POS terminals and payment application software, inadequate key management solutions leave retailers vulnerable to data breaches. Although all POS vendors must certify their payment application software under the PA-DSS standard, many vendors skate by with poor encryption and encryption key management that has been thrown together to meet the bare minimum requirements. Although their vendors have passed the test, retailers are still experiencing some of the largest data breaches because their POS vendors don’t adequately protect encryption keys or use encryption key management best practices to secure cardholder data. 1. Encryption Key Management that is Easy to Use - Good encryption key management should be easy to install, configure, evaluate, license, and sell to end users. Townsend Security’s 1U server plugs right into your IT infrastructure and requires no on-site technician to install. Our cross-platform encryption key management HSM integrates seamlessly into Microsoft, IBM i, Linux and other legacy platforms. Our team provides training, OEM integration, NIST and FIPS certifications, marketing materials, and consistent back end support as well as sample code, binary libraries, applications, key retrieval and other tools you and your customers need to implement encryption and key management fast and easily. 2. Encryption Key Management that is Cost Effective - Small and mid-sized retailers are a growing target of hackers due to the fact that these companies tend to have less data security. These companies, however, need to secure their sensitive data and must meet compliance regulations just like larger businesses do. We strongly believe that cost should not be a barrier to any business. Townsend security offers cost-effective licensing and easy deployment for seamless integration in less time and at an affordable price. We also offer OEM and “white label” options to save time and pain around branding. 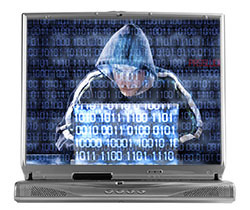 The average data breach costs a company $5.5 million. With better encryption and key management, you can save your customers millions of dollars. 3. Encryption Key Management that Protects Your Company in the Event of a Breach - In today’s technology climate, data breaches are no longer a matter of “if,” but “when.” Even the strongest networks can be hacked. The only way to secure data is to encrypt the data itself, thereby making it unreadable and unusable to unauthorized users. However, the encrypted data is only as safe as the encryption keys! In the retail industry, the responsibility of a data breach will fall on the retail company that experienced the breach, as well as the POS and software vendors. If a breach occurs to one of your customers, encryption key management will protect your customers and protect your own organization as well. Almost every single POS vendor offers encryption and key management for their payment applications, but not every POS vendor does the job right. In these cases, a retailer may pass a PCI audit but still be vulnerable to a data breach. With a NIST-certified OEM encryption key management solution, a POS vendor can offer retail customers the best data security available and generate new revenue with that offer. The last thing a POS vendor wants is a data security plan that looks good on paper but doesn’t deliver when the going gets tough. The good news is that the right tools are easily available to companies who want to not only meet, but exceed compliance and prepare for evolving data security standards. “Good security breeds good compliance and not the other way around -- compliance is the low bar,” says Mark Seward, senior director of security and compliance for Splunk. With a Townsend Security partnership, POS vendors can offer their customers industry standard and NIST/FIPS certified solutions by implementing an OEM encryption key manager that is customized for their specific applications.